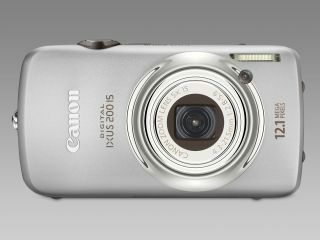 The Canon Ixus 200 IS combines a super stylish exterior with a host of advanced and fun features and Canon's first ultra-intuitive touchscreen - making it the perfect Christmas party companion. And we've got two to give away on TechRadar this week. The image Stabiliser and 12.1 megapixels delivers crystal clear images, whilst the 24mm wide angle lens guarantees great group shots; every time. Face Detection Technology ensures that all your friends are in the frame and a 5x optical zoom allows you to get up close and personal – ideal for capturing moments under the mistletoe. The Ixus 200 IS also enables you to record in HD, so you can capture festive footage as well as stunning stills. The Ixus 200 IS packs a serious punch; offering dazzling design and high-performance. This competition is now closed. The winners are Don Stollery and Ruth Waters.